The roof of the coach was one of the easiest things to do. A ready-cut, ready curved roof is supplied with the kit. All I did was spray it with Humbrol primer. I like the grey colour and I will leave it like this. The roof isn’t glued in place yet. There are a few steps to do before I finish the coach. 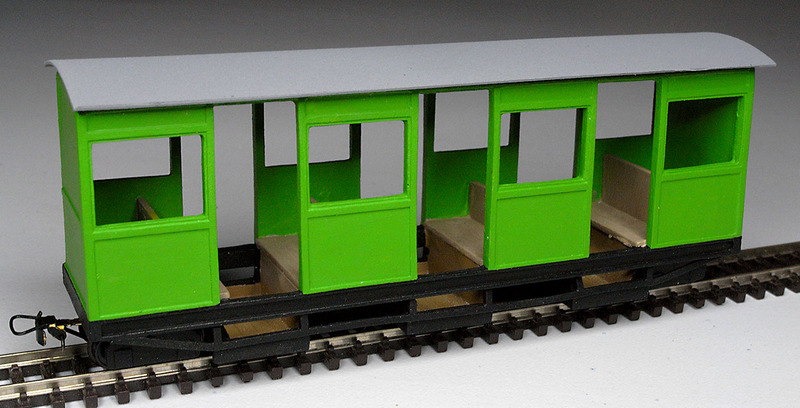 I want to add some decals, then passengers to the coach. Then I will varnish the coach and, finally, add some windows. I haven’t used decals for over 30 years and I need some practice before I apply them to the coach. So, the model will go back into the drawer while I experiment with different ways to apply decals.